This course includes information necessary for the proper design of 400-Hertz (Hz) conversion, distribution, and utilization systems. Special regard is paid to systems utilizing medium-voltage distribution. Systems supplying 400 Hz for ground-power operations use frequency conversion equipment to change 60-Hz input to 400-Hz output. Rotary converters (motor generator sets) or solid state converters are used for this purpose. Fixed service point units to which avionics equipment and aircraft are connected are supplied from either nearby frequency conversion assemblies over a low-voltage feeder system or from a more remotely located 400-Hz central plant using medium-voltage feeders. Find out about the inductive contribution to the reactance voltage drop of 400-Hz systems which necessitates certain modifications to conventional distribution and utilization system design to compensate for the increased voltage drop. Learn the fundamentals of system layout.. This course is intended for electrical engineers wanting an introduction to 400 Hz electrical distribution systems typically required at airports and specialized research and development facilities. This course will give electrical engineers an introduction to the principles and practices for design of 400 Hz electrical power distribution systems. 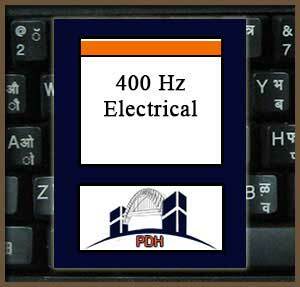 This is an introduction to electrical distribution systems operating at 400 Hz. This course will give you an introduction to 400 Hz electrical power distribution systems for airports, airfields and some research and development activities.